Of the dual sector universities, at least Victoria University (VU) is struggling and probably Swinburne. There have been successive waves of redundancies at VU and another wave looks imminent, with a major restructuring of the university just announced. The TAFE activities, up to Cert IV, are being spun off into a technical college, which could well be the first step towards ultimate divestment. In public policy terms, the character of an institution delivering a qualification – public or private, TAFE or university, state domiciled or interstate – doesn’t actually matter, so long as what it is providing represents value in terms of both cost and quality. It could be argued that, setting aside the inevitable implementation issues that come with such a systemic shift, the evidence of the Victorian market-based reforms is that opening the publicly funded training sector up to a greater role for private providers has led to increased participation, improving the skills of the workforce and therefore productivity, and improved equity by increasing both the choice available to individuals and access. That could be argued but you would need to cross your fingers behind your back (and definitely not cross your heart and hope to die) to argue it. The stories of utter rorting are legion – like the private RTO that grew enrolments in education and training by 4000% in just a year or the private RTO that offered sporting organisations kickbacks to spruik their courses. The Scan did its own random survey of private providers and it seems that the emerging industry standard is that you can secure a CERT III/IV with about 40 hours of work and diploma with 60-80 hours. The nominal hours on your personal training plan will show 400-800 hours to comply with the AQF but wink, wink, nudge nudge etc. And if you’re doing it online (as many of the offerings are), you needn’t even bother with that: invite your friends around for a study session, provide beverages and comestibles, and you could knock it over in no time at all. The end result is that any VET qualification in Victoria delivered outside the public TAFE system over the past couple of years has to be considered suspect (which is, of course, tough on the many reputable private RTOs). The qualifications system has been debased. So the Victorian Coalition government inherited a training mess. And a budget problem: state sourced expenditure on VET has gone from $800m in 2008 to possibly $1.5 billion this financial year – and growing. The government obviously had to act, both to protect the integrity of the training system and to protect the public purse. In October 2011, funding to support what might be broadly termed the community service obligations (CSO) of the biggest TAFEs was slashed by 25%, apprenticeship fees were increased and funding for the seven fastest growing areas of enrolment (including business studies, hospitality and fitness training) was reduced to rein in runaway growth (and dubious quality of provision) in the private sector. The public TAFEs were reported to be “stunned” and “shocked . Measures to be announced in the budget on 1 May, “pre-announced” in The Australian on 28 April, have elevated the attitude of TAFE stakeholders to apoplectic. By one of those quirks of fate, the Australian Education Union was holding its annual TAFE conference in Melbourne on 28/29 April and it was the topic du jour (check the traffic #TAFE on Twitter). In effect, the government is introducing “competitive neutrality” into the training market. None of this nonsense about funding TAFEs to meet any sort of CSO: an additional base funding allowance of up to 22%, designed to help them provide a full range of training services, is to be removed. Funding rates are to be slashed from between $6.50 and $8.00 to less than $2.00 an hour per student, in business, hospitality, retail, customer contact, process manufacturing, events, fitness and sport. On the upside, high-demand courses in high-cost areas such as roof tiling, aeroskills and mechanical trades will attract between $11.00 and $12.50 an hour. This obviously favours TAFE because, at the moment, such training is dominated by TAFE but under the new “competitively neutral” funding arrangements that may change (and quickly, too). We really need to await the full budget detail to draw final conclusions: the government has got the bad news out of the way so will there be any measures to soften the apparent blow to TAFE – for example, something to support the already wobbly regional TAFEs? Peter Hall, the skills minister, is a National Party member based in Gippsland, so you would think he might be uncomfortable leaving regional TAFEs to simply swing in the breeze (he certainly has been in the past – Drop in TAFE enrolments concerning). But the feeling among TAFE stakeholders is one of despondency, unremitting gloom and doom. As one authoritative commentator put it to The Scan, TAFE in Victoria is “rooted”, or words to that effect. Another stakeholder observed that the “mad Victorians”, having stuffed up the international sector, are now doing the same to the domestic market. We’ll see. 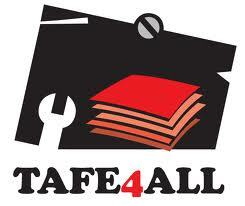 Publicly provided TAFE will survive, for the time being at least, but it is hardly likely to prosper. You can see a path where many of the TAFEs become residualised, with underutilised assets and need “special assistance” to cover declining revenues. This runs counter, of course, to the logic of “marketisation” as it has finally emerged in Victoria and so you end up at privatisation. And you ask the question “why”? Certainly the disorderly and disruptive process of skills reform in Victoria doesn’t seem to have served any public good: it’s blown the budget and debased the qualifications system. And it’s degraded what was once such an important public asset and contributor to the public good: Victoria’s public TAFE system.